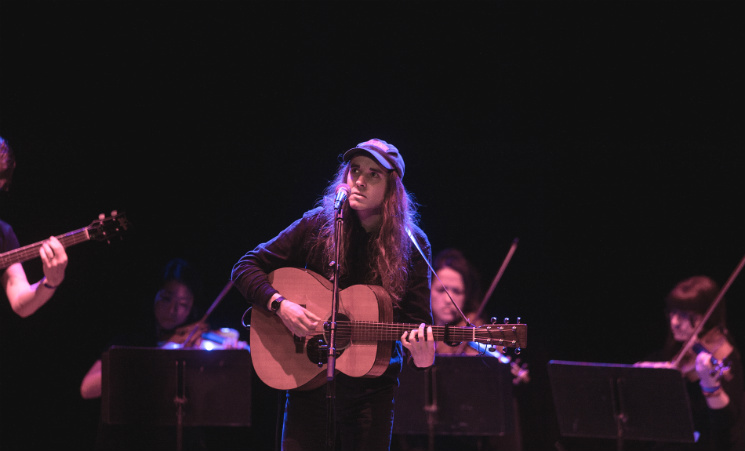 For Andy Shauf and his band (a sprawling 10-piece last night, November 23) Massey Hall marked a safe and triumphant return home from practically a year and a half of constant touring for his breakthrough 2016 album, The Party. "Time to make dinner again and stop calling for takeout," Shauf said, in one typically brief and shy attempt at banter. "Time to work on writing a new album." He also asked the crowd how they were doing and tried to do a Q&A, which was a little chaotic as people were yelling from various corners of Massey Hall. But it was a reminder that there's a regular guy behind these incredible songs. If Shauf's banter was awkward and shy — not unlike that of the characters navigating the daunting social situations in his boozy story songs — his music was anything but. Songs from The Party were smooth, mellow toe-tappers, augmented by lovely bass clarinet, clarinet, an organist, a string section and jazzy work from Olivier Fairfield on drums. Lush and dreamy, Shauf's current configuration often brings a Bossa Nova feel to the songs. In addition to playing the entirety of The Party (not in order, he said, thanks to the annoyance of having to move his capo), Shauf played a handful from his 2015 album The Bearer of Bad News, as well as single "Jenny Come Home." As wonderful as his band was, it was a treat when he came out for the encore solo and sang "My Dear Helen" (also off The Bearer of Bad News), shining the spotlight on his fascinating (slightly terrifying) lyrics and unusual, haunting voice. For Jennifer Castle, who opened the night, Massey Hall marked a different but very special arrival: it's hardly possible to imagine anyone with a voice and material better suited to that iconic room. She took it in stride, thanking Massey Hall and Andy Shauf for having her. Castle began her set magically and collaboratively, giving the stage over entirely to Brodie West, a jazz sax player whose notes float off at the end of Castle's celebrated 2014 album, Pink City; last night, his protracted sax solo instead meandered dramatically into the song, setting the stage for a new, sparse sound that worked brilliantly in Massey Hall. Backed by Jonathan Adjemian on piano and the Highest Order's Paul Mortimer on guitar, and with a special emphasis on responsive backup vocals by Victoria Cheong and Isla Craig, Castle reimagined songs from Pink City — "Like a Gun," the striking, darkly humorous "Nature," "Truth Is the Freshest Fruit" and "Sailing Away" — and played a song about songwriting from her first album. She also took the opportunity to debut a handful of songs off her upcoming fifth record, which will be entitled Angels of Death. By the sounds of it, it won't be a picnic (the bluesy "Crying Shame" is one of the new ones), but it will be illuminating and fortifying. For at least a song and a half, Castle's light fingerpicked guitar wasn't coming through the PA system, but it hardly mattered: it was heaven hearing her voice fill that room.